We congregated at the usual venue – Tea Rooms at Darnum at around 10:30am for an 11:00am start and after our usual chat; all mounted our trusty steeds (after warning John Fowler to remove his lead boots). We proceeded to wend our way through the most delightful countryside this side of Eden (and I don’t mean that town further East) to arrive at the Esplanade Hotel in Inverloch. 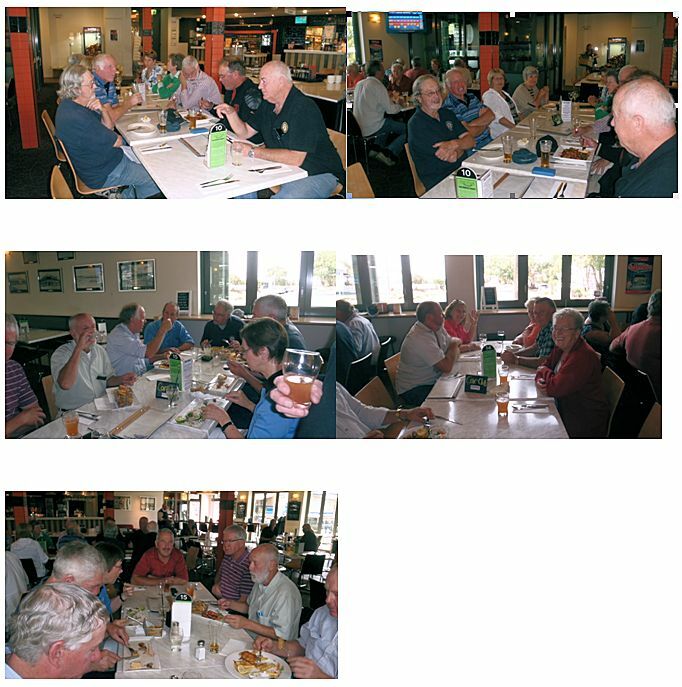 Everyone enjoyed a very good meal (at least I didn’t hear anyone complaining) with a varied selection on the Seniors Menu for those of us eligible. When is the next midweek run? About a dozen cars gathered at the Darnum Road House for an 11.00am departure. John Fowler issued maps and route instructions. After a drivers’ briefing we set of following John and Jan in the Sprite. As we stayed together behind John it meant that our route notes became a bit redundant ! Our route wound around behind Warragul and Drouin through Gainsborough, Bona Vista and Lardner to pick up the Drouin-Poowong North Rd. From there it was over a badly cut up and pot holed Invermay Rd to the Drouin Poowong Rd, then on to Poowong, where we were meant to meet Peter Witney and his navigator Lachy McCrorey, however, they had given up waiting and went on ahead to the Inverloch Hotel where we caught up with them for lunch. From Poowong it was down the Bass Valley Rd. with its picturesque one way bridges and not so picturesque large tractors with hay bales appearing around blind corners. Under the Mid Gippy Highway and into Bena. From there it was over the hills to Geetho. Once on top of the Strzelecki’s we turned onto the Glen Alvie Tourist Rd which had just been resurfaced and widened, so John gave the little Sprite its head over this magic piece of road with its open sweeping bends and undulations. It was fun keeping up with him in the old Pug (Peugeot). After this bit of fun we dropped down the other side of the hills onto the Korumburra-Wonthaggi Rd continuing onto the Korumburra-Inverloch Rd and from there into Inverloch for lunch at the Hotel where we met up with Peter and John Althuizen, plus a few other members who had made their way independently to Inverloch. We had two tables reserved for us and the menu was varied and delicious. After lunch we walked our lunch off with a stroll to the beach and around town for a bit of shopping. We then found our own way home. Thanks to John and Jan Fowler for a great mid week break. Thanks for the nice comments. It was a very enjoyable run through some of the most scenic roads we have in the region. All 26 of us at the Esplanade seemed to get their varities of delicious meals quite quickly, and it was great company. Jan would like to do the next Mid-week Run possibly to Cowarr Cricket Club Hotel on Thursday 27th March. Let Jan know if you are interested.